We've spent years waiting to see what all the secretive fuss was about, and now that the device is in our hands, we can finally begin showing you images of what the Magic Leap One experience looks like. This is especially important given the fact that the vast majority of the planet still can't buy one. And even in the US, only residents in a few select cities have access to sales of the device (and the limit is three devices per person). So if you're not in one of the current "Magicverse" cities (Chicago, Los Angeles, Miami, New York City, the San Francisco Bay Area, and Seattle) and were wondering if you should start saving up cash to get your hands on a Magic Leap One, these images may help you make a decision. These images are not a 100% accurate reflection of what the virtual objects look like when looking directly through the Magic Leap One. But before we dive in, we should make one major caveat: These images are not a 100% accurate reflection of what the virtual objects look like when looking directly through the Magic Leap One's lenses with the naked eye. Specifically, when looking directly through the Magic Leap One, images are clearer and more detailed than these images would indicate. Similarly, the images aren't as bright and washed out as what you'll see in these photos. With all that said, here are just a few early images of what augmented reality looks like through the Magic Leap One. In the image above, you see somewhat familiar images that are drawn from Magic Leap's Create app. Shown in the photo are an array of virtual images, including a jellyfish, flying saucers, and a dinosaur anchored to a couch. In the image above, we again see a translucent virtual flying saucer (which, we stress, looks better in-person), as well as the app's options menu floating in the background. 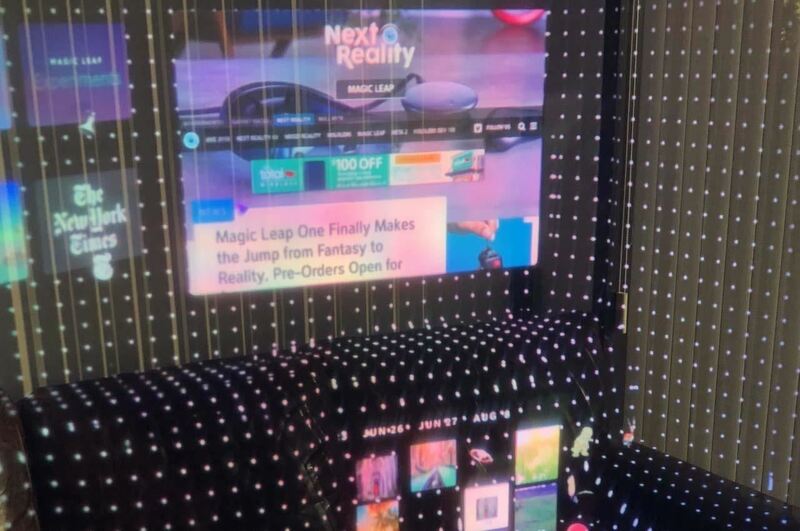 Of course, we had to see what the Next Reality website would look like using Magic Leap's Helio web browser in the Lumin OS. As you can see, even in this not-completely-accurate photo, the text is readable from fairly far away. Nearby, you can also see two menu carousels, one of which shows the presence of The New York Times, a Magic Leap content partner we've mentioned before. Next, here's a look at Magic Leap's WorldMesh, the dynamic that allows virtual objects in the system to detect, interact, and respond to objects in the real world. Finally, we see the WorldMesh points displayed along with the Magic Leap One's menu items indicating a Wi-Fi connection, the current date and time, settings, and battery life. As Magic Leap has mentioned before, there are limitations to what can be represented in photos and videos compared to what you'll really see (and feel, in terms of experience) when donning the Magic Leap One. So unlike our previous hardware close-up, don't take these images as a final indication of what you'll see when you use the device. However, if you wanted a taste of the Magic Leap One's visuals, without any of the company's direct interaction or control, here's your first real look.